This is a tutorial which illustrates how to use quantized GluonCV models for inference on Intel Xeon Processors to gain higher performance. The following example requires GluonCV>=0.4 and MXNet-mkl>=1.5.0b20190314. Please follow our installation guide to install or upgrade GluonCV and nightly build of MXNet if necessary. 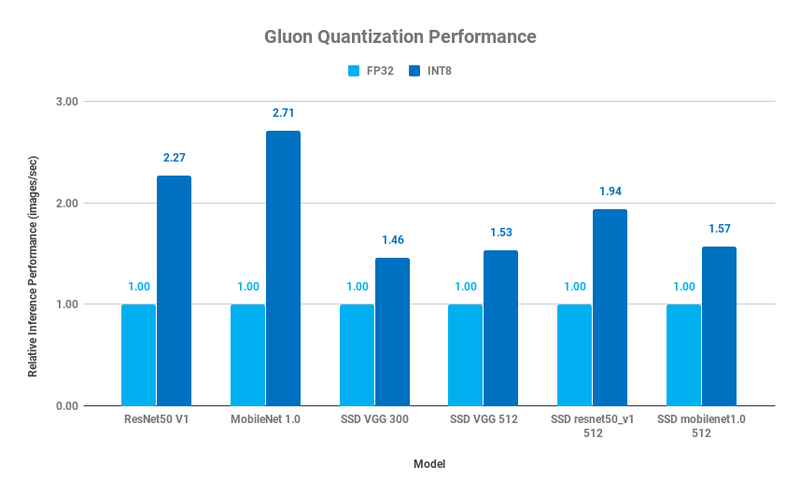 GluonCV delivered some quantized models to improve the performance and reduce the deployment costs for the computer vision inference tasks. In real production, there are two main benefits of lower precision (INT8). First, the computation can be accelerated by the low precision instruction, like Intel Vector Neural Network Instruction (VNNI). Second, lower precision data type would save the memory bandwidth and allow for better cache locality and save the power. The new feature can get up to 2X performance speedup in the current AWS EC2 CPU instances and will reach 4X under the Intel Deep Learning Boost (VNNI) enabled hardware with less than 0.5% accuracy drop. Please checkout verify_pretrained.py for imagenet inference and eval_ssd.py for SSD inference. GluonCV supports some quantized classification models and detection models. For the throughput, the target is to achieve the maximum machine efficiency to combine the inference requests together and get the results by one iteration. From the bar-chart, it is clearly that the quantization approach improved the throughput from 1.46X to 2.71X for selected models. Below CPU performance is from AWS EC2 C5.18xlarge with 18 cores. Quantized SSD models are evaluated with nms_thresh=0.45, nms_topk=200. --num-gpus NUM_GPUS   number of gpus to use. Load weights from previously saved parameters.